I've always wondered why everybody likes to invest in tech shares. They can be multibaggers, but returns from non-tech shares are many times just as good, if not better. Most importantly investors in older, staid companies usually don't have to worry about product obsolescence as much - or as quickly - as in tech companies (think Blackberry and HTC). An example is Taiwan. It has some of the most cutting edge and best tech companies in the world. Almost everybody I know in Taiwan is somehow involved in it. However returns from non-tech shares have many times been higher as I show in the re-posted article below. The article below was originally published on Quamnet.com in February 2015, but it has since been removed from their site. It's one of my better observations and one that I don't want to lose sight of. I've written in the past that profitable investments are typically found where others are not looking and this is in the same vein (see here). The reminder that I wrote this came from a recent Quartz article that points out that since they both went public in the summer of 2004, non-tech Domino's Pizza has returned 2,400% which is a bunch more than tech high-flyer Google's 1,555% (see here). I was in Taipei the week before the Chinese New Year. I’m a big fan of Taiwan. Nice people, clean cities, good infrastructure, and I can practice my bad Mandarin on unsuspecting taxi drivers. I can also talk about Taiwanese stocks with locals who closely follow the market. Most of this centered on which Taiwanese companies will do well by supplying to Apple. Several felt that TSMC will take core chip supply contracts from Samsung. Others speculated on how much of Apple’s new products will be manufactured by Hon Hai/Foxconn. Not many were talking about UMC on the latest trip, but around 10 years ago it seemed like it was all about the two fabs (i.e. the two large semiconductor manufacturers in Taiwan- United Microelectronics and Taiwan Semiconductor Manufacturing). Nobody mentioned some of my favorite Taiwanese companies – Hotai Motor, Giant Manufacturing and Taiwan FamilyMart. I’ve been a fan of them since my 2005 research trip to Taiwan when equities there were not so expensive. At that time, very few people were looking at these companies and I could easily arrange management visits and factory tours. All of them operate fairly straight forward businesses. Giant manufactures and sells some of the world’s best value bicycles, Hotai distributes Toyota and other vehicles, and Taiwan FamilyMart owns and runs convenience stores throughout the island. They all had pretty similar characteristics when I looked at them in 2005. Good dividend yield, a net cash or low debt balance sheet, a simple shareholding structure with organic rather than acquisition-led growth. They fit into my people, structure and value model that I’ve been developing over the last several years (although looking back they were a bit more expensive than what I typically like). None of them are tech companies. None of them were followed by more than a handful of analysts. None of their CEOs or owners were in the press. None of them had secondary or overseas listings. 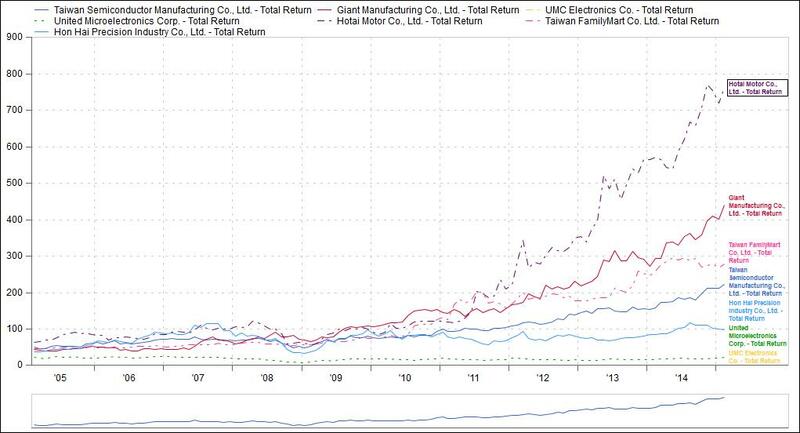 However returns of all three of these low-tech boring companies have outperformed the highflying tech and electronics firms that were so popular back then. Hotai’s 10-year total CAGR was 32.1%, Giant’s was 26.1% and Taiwan FamilyMart’s was 19.5%. The average CAGR of the three was 25.9% which means that an investor would have doubled their money every 2.8 years by holding an equal weight in these stocks and collecting dividends. 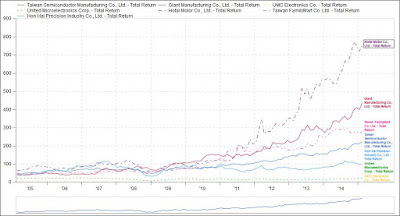 Holding three of the more popular and biggest companies in Taiwan 10 years ago would not have led to as good returns. Holding a basket of TSMC, UMC, and Hon Hai and collecting dividends would have left one with an average CAGR of 8.6%. This means that an investor could have made 17.3% more every single year on average by holding the boring stocks rather than the exciting, cutting-edge ones. In addition to their low-profile management the three companies share another classic characteristic. All three directly sell to end consumers. This is in contrast to many high-tech firms that sell their products to other manufacturers or branded product companies. Apple’s customer ownership and very high margins means that their suppliers operate on thin margins. Taiwan equities today are not as inexpensive as they were in the mid-2000s. While Taiwan is not as expensive as other countries in Asia such as Indonesia and the Philippines, there are few companies in these later two that are trading at valuations I consider attractive. It’s fun to read about and imagine the wondrous things that high-flying, cutting-edge technology companies can do for us. But – as for profitable investing in Taiwan and elsewhere – it pays to look where others don’t.